Earlier this year, I visited Durdle Door in Dorset. I never got round to writing about it, but as I was going through my photos, I realised that I have some truly remarkable shots of the seaside, which I just have to share. The weather was rather dull – clouds and grey skies – which makes the electric blue shades of the water even more impressive. Please also note that with the exception of the last photo, all the photos are completely unaltered – no filters or colour adjustments. I follow these people for their fitness videos, they have loads of fun, varied workouts for different abilities and interests, and thought this rant was a good watch. I felt that they covered a lot of issues to do with the latest trend of people sharing photos of ridiculously cut abs, round butts etc with a pseudo-motivational message. They make a good case for fitness and exercise -without- the fashionable focus on an ideal body shape. It’s definitely something to watch if you’ve been disheartened by what a lot of people advocate as the ‘perfect body’, which is unachievable for most people. I already have a draft post that’s been half-written for nearly a month now. The problem with that is that there’s too much to describe and I think I’m a little too pedantic, which makes it more work than it really should be. However, I had a lovely time in London over the weekend and thought I’d share a little of what I ate. First, I made figs and goats cheese as a quick starter for lunch on Saturday. 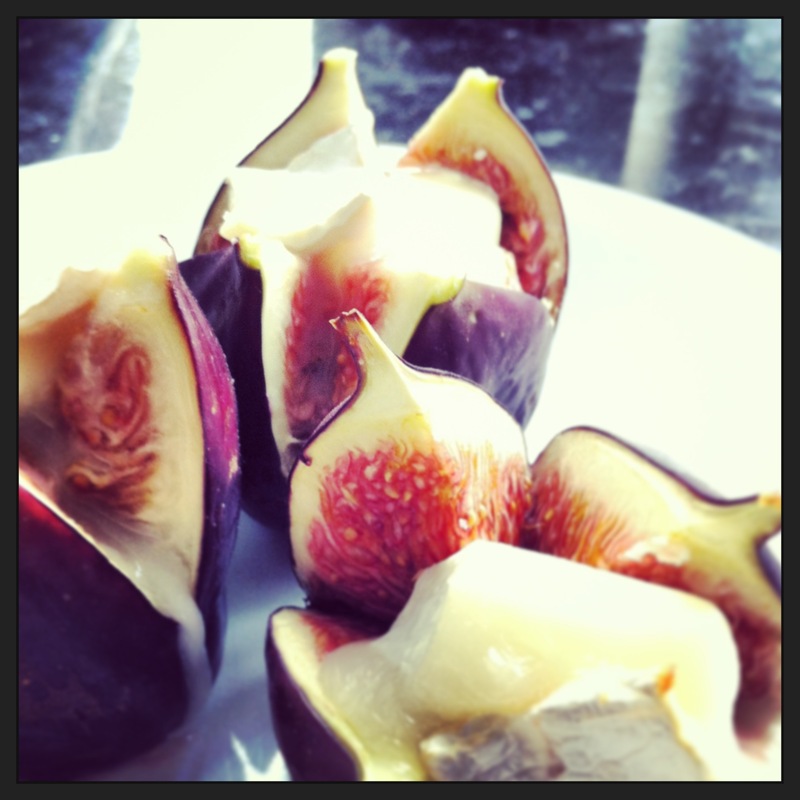 I believe figs are in season now, and the figs we bought certainly lived up to that, subtly sweet and juicy. I picked up some goats cheese from the butcher down the road – it’s a gorgeous sweet, cheese with a rind and creamy outer layer similar to camembert, with a firmer, almost crumbly centre. After slicing the figs open with a cross-cut (see this for a proper written description), I wedged a small piece of the amazing goats cheese in the centre. Then I baked them at about 180-200°C for 5 to 8 minutes, just enough to melt the cheese and allow the figs to warm up a bit. It’s a classic pairing and I certainly understood why after the first, warm burst of sweet and salty melted cheese in my mouth as I bit into the fig. As I type right now, I look up occasionally and see the heavy raindrops pitter-pattering outside the doors leading to the garden. It’s a strange sort of rain – heavy, but not a proper downpour, and the sky has that weird quality of being almost overcast, but not quite. The sun’s managed to peek through a little so overall there’s a rather dreamy feel to it. I’ll stop rambling on about the weather now, even though it was what originally inspired me to write this post. The past month or so has been filled with mostly glorious (read: sunny) weather, although I do draw the line at 30°C heat in a country that’s built around a climate that doesn’t usually stray over 20°C. Owl City has a lovely, lovely song called Vanilla Twilight. It’s a simple song, with a simple melody but everytime I hear it, I positively swoon. I suppose it’s just the deeply buried romantic in me clawing to get out. The line that made me sit up and notice this was “…the spaces between my fingers are right where yours fit perfectly.” Isn’t the imagery just beautiful? The photo I’ve used is one I took of the Lakeside Park just by Nottingham University, where the tree branches conveniently shaped themselves into a heart shape. Yes, it’s official, I am a soppy romantic.